Screenshot from Keynote: Business opportunities await for hotels to bless and certify peer to peer home sharing, matching trusted customers from loyalty programs to local experiences, and selling value added services and goods like cleaning, concierge and those fancy soaps. Read full report and see keynote video. Update July 25: I visited Airbnb HQ, see my notes in the comment section. The industry is abuzz from the NYT article by Tom Friedman blessing the sharing revolution, his closing line states; “The sharing economy — watch this space. This is powerful.” In this piece, Tom cited Airbnb starting to eat away at market share, and compares this rapidly growing startup to other giant hotels, like Hilton. I’ve been conducting research on how corporations can be involved in this new revolution, called the Collaborative Economy, and see some business opportunities. For most large corporations and established institutions, the natural reaction to an invader is to fight them. For hotels, they’ve continued to fund lobbyists who support the established hospitality industry, and are fighting Airbnb at every guest room, house, and city around the globe. 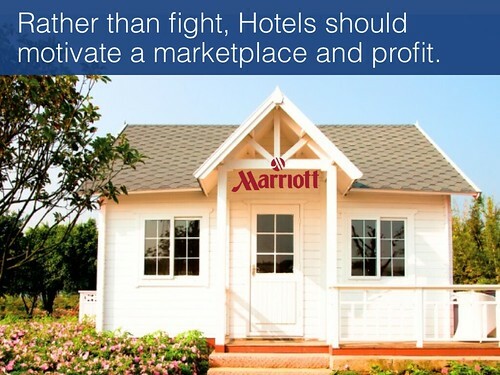 I’m here to tell you that hotels like IHG, Marriott, Hyatt, Hilton, Starwood and others don’t have to fight this inevitable movement. Instead they can collaborate with this market and profit. How? They can provide by adding new value added services, take a cut from the transaction costs, and reduce operating expenses. In this most advanced form, hotels themselves could create their own two sided marketplaces and host their own HiltonBnB. Then they could facilitate the matching of hosts and guests at local locations like guest houses, vacation homes and other inventory on AirBnb. Following this, hotels could take a cut of every transaction, and provide new value added services like cleaning, concierge services, and even sell branded goods to local hosts. Local hosts get trusted customers, guests get local experiences at a standardized quality, and the hotel gets new revenues. The scenarios are listed in a maturity order, from easiest but greatest listed first, to the highest investment with highest return listed last. Companies should build their plans based on this scenario based model. 1) Ignore it, and hope it goes away. An easy solution is to avoid it, or don’t look at it. Head = Buried. Rather than give any attention to the sharing revolution and legitimizing its existance, ignore it, and it will go away. High risk. The risks are that if it doesn’t go away, your company will significantly be behind as the world has moved forward. 2) Fight it with policy, lobbying, or marketing. Using the law, aggressive marketing attacking quality or lobbying groups, corporations can attack the sharing revolution in an assertive stance. Current investments in legal, lobbyists, are already made, and are setup for business model protection. These systems are already setup in place for the defense of the company. Short term win. While it can be deemed illegal in some marketers, global coverage will be impossible to stop, and nearly impossible to enforce. Amsterdam guests and hosts were able to connect to each other –bypassing local laws. 3) Sponsor the startups. Corporations can add their brand to this movement, such as Barclay’s card sponsor London bike sharing, Citibank in NY, BlueCross BlueShield for Minnieapolis bike sharing or NBC sponsoring Yerdle. Low investment with a high brand association with this sharing movement. Also reduce liability as the brand sponsors “aka advertises” on the sharing revolution. Lack of business model change means great visiblity for the CMO but does not direclty increase revenues from a sharable or collaborative business model. In the end, this model can’t sustain on its own. 4) Acquire the startups. To date, we’ve seen smart purchased by Avis of Zipcar and Enterprise Holdings making acquisitions, showing the value of getting into this market at an early stage. An easy way to get into the market is to acquire the threatening startups. Great way to enter a new existing marketplace and recoup revenues faster than buying. This can get expensive quickly, and doesn’t stop new competitors from emerging if your business model itself has not changed. Short term, and expensive. VCs see this pattern and will pump more money into startups, raising valuation. 5) Integrate your business model. Corporations can work with startups by enabling their own products to be shared and passed along in these marketplaces. Patagonia has worked with eBay, and GE has partnered with Quirkly to innovate new products A great stepping stone without fully committing your company, investments, or assuming full liability as your partner with these startups. While an increased involvement in the collaborative economy this partnership could fall short as the brands are not onwing the experience, data, potential revenues and profits. 6) Build your own marketplace and platform. In the most advanced model, I expect a new class of corporations to host their own communities that enable customers to trade, rent, resell their goods and services in a brand hosted community, enabling new value for the brand, and offering the brand new ways to extract value. Own it yourself, build your own branded marketplace or platform that enables customesr to buy and sell and build next-generation products. This yields greatest potential return as brand owns data, all revenues, and potential IP from collaboration. Highest liability and highest investment required to fulfill this model, where a company becomes like an eBay or AirBnb or innovation platform. Companies need not fight the revolution –instead they should collaborate in this economy. In Tom’s article, he did a great job of stating that the movement is here, and that corporations are becoming disrupted. What he didn’t do is state the solutions that hotels (and all companies) must wrestle with to engage in this market. If you want to learn more about the solutions, read the report on the Collaborative Economy Value Chain and learn about the three business solutions: 1) Company as a Service 2) Motivate a Marketplace, 3) Provide a platform. In it, we identify new business opportunities for hotels to profit by enabling the sharing revolution, rather than fighting it. To quote Tom Friedman, “we must watch this space, it’s powerful”, I want to challenge business leaders to take it to the next step, and not just watch this space, but lead it. Join me.